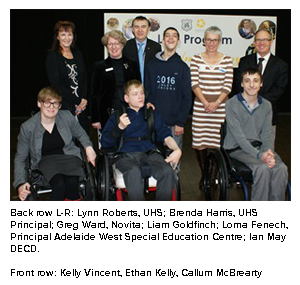 On Monday 12 September, Unley High School celebrated the 20th anniversary of the Link Special Education Program. The milestone was marked by a celebration assembly attended by UHS students together with special guests including former UHS student and politician Kelly Vincent, Novita CEO Greg Ward and DECD Disability Policy & Programs Director Ian May. A morning tea followed the assembly. This unique program is run by the Adelaide West Special Education Centre and provides support for students with physical disabilities as they progress through main stream schooling at three sites – Mitcham Primary School, Roma Mitchell Secondary School and Unley High School. World Teachers Day, inaugurated on 5 October 1994 by the United Nations Educational, Scientific and Cultural Organisation (UNESCO), is celebrated in more than 100 countries world-wide and recognises the very important role that teachers play in society. Internationally, the day is held on the first Friday of October however, due to Australian school holidays, we celebrate on the last Friday in October. On Friday 28 October the TRB will join the Council of Education Associations of SA for their annual awards ceremony that acknowledges and celebrates educators and the professional associations that support them. Reflect Growth – is holding an Assessment workshop that will provide teachers with the opportunity to share assessment strategies, evaluate their thinking and develop approaches for Term 4. A certificate of attendance will be issued. Seaford Community Centre, Thursday 6 October 9.00am to 12.00pm. Tickets here. Edufolios – Creating an online portfolio of practice – introductory session. For anyone interested in learning about keeping an online portfolio of practice, including practical tips to help you become efficient at finding opportunities to reflect especially with teacher registration and career progression in mind. A certificate of attendance will be issued. Seaford Community Centre, Thursday 6 October 12.30pm to 2.30pm. Tickets here. SHine SA presents Relationships & Sexual Health Education for Aboriginal Students, a two day workshop on relationships and sexual health. FREE. Port Augusta Secondary School, Friday 14 & Saturday 15 October. Find out more here. The Hartley Institute is holding a 3-hour workshop, Managing People & Teams: Constructive tools for leading team meetings and developing staff for school leaders and aspiring leaders looking to enhance their skills. The Hartley Institute, Capper Street, Kent Town, $150, 9am – noon, Thursday 27 October. Find out more here. FlipCon Adelaide is being held on Thursday 17 – Saturday 19 November at Brighton Secondary School. No prior experience in flipping your class or school is needed. Find out more here. Jolly Phonics full day training, $165, Wednesday 12 October, 9.00am – 3.30pm, EDC Milner Street Hindmarsh. Find out more here. Idealearning runs face-to-face, specifically tailored professional learning workshops for schools on request. Each workshop is specifically tailored to suit the needs of schools and topics are evidence based and suitable for the Pre K – 12 range. To arrange a workshop at your school email connect@idealearning.